Being a mother is a full-time job regardless if you’re a full-time working mum, work-at-home mum, part-time working mum or a stay-home mum. Just ask any mum, and they’ll tell you that the phrase “working mum” is a rhetorical term. As mum, we are all things to everyone with a thousand and one things screaming for our attention everyday. For the past few weeks, I struggled with work-life balance with long hours at work in order to meet deadlines. On top of that I felt that I was neglecting my blog and questioned if I could find time to maintain a blog. Contrary to what many people think, writing a blog post is not just about some words and some photos and I do put in time and effort into mine. Many a times, I returned home feeling exhausted and even ended up taking out my frustrations on Alexis and Sophie. That was when I knew I needed a time-out, to slow down and focus on taking care of myself because frankly my family deserves to retreat to a happy home starting with a happy and positive mum. I decided then that I have to start taking care of myself for a change and not get lost in the whirl of things. So if you’re in need of a mummy break, here are 5 five simple things you can do too. Who has time for exercise, you may ask? But the question is, can you afford not to since you already know the benefits from it? After completing the Jurong Lake Run, my exercise regime got neglected as I got busy at work. It proved to be a mistake as I felt more lethargic and no amount of caffeine could keep me perked up. In order for me to keep to my exercise plans, the best way is to set aside time for exercise is in the morning. That way, I don’t have to allow my work schedule to derail my exercise plans. Give yourself a target to work towards, be it losing x kg, completing 3k in x minutes. And yes, I have to start training for the Vertical Marathon 2012 that’s in November and Alexis has agreed to take up the challenge with me! I was reminded of the importance of feeding my body well when I saw Cedele’s motto at lunch one day “Eat well, be well”. How true and how I needed that reminder to feed my body well as I’m a victim of emotional eating whenever I get stressed. And the best way to feed my body well is to make wise food choices starting from cooking my own meals. It can be tougher for working mums, but with advanced menu planning, it’s possible and I hope to get back in the cooking groove. A visit to the hair salon always makes me feel like a million bucks. With a few snips, a new hair color, I walked out feeling like a changed person. Makes me wonder why I don’t do this often enough. Now that I have a breather at work, I’ve been catching up with different groups of friends for lunch. I’m always so thankful for my friends who have been a tremendous source of support in my life and as fellow mums, we keep reminding each other that we are still individuals with our own dreams and interest. It’s always great to be reminded that we are more than just mums. Most important of all, I know that when I’m taking care of myself, God is taking care of me too. In my moments of busyness, it’s easy to allow my heart to get discouraged and get stuck in negativity. But after these weeks, I have been reminded that God is my ultimate resting place and His Word is designed to fill me up. I was greatly encouraged by this verse knowing that my rest comes from God and only He can truly meet all my needs. I came across this quote and would like to share it with you “Life is for Living”. So in moments when you feel overwhelmed with all your cares and worries, remember that you only have this one life to live. So live it fully and make it count! Do link up for my Motivational Mondays post and share a motivational post or even a goal that you have set for yourself for the week. Don’t forget to grab my badge below and include it in your post after you have linked up and leave me a comment too. 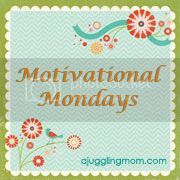 I will be hosting Motivational Monday every week and I hope that you can all join me every Monday. Have a great week ahead! I’m getting used to my new haircut too. Are you going for a haircut too? Glad to read that you are taking time out for yourself and slowing things down. Love your new look! very refreshing;)! Yes you’re right that it does take effort to recharge ourselves. A sleep debt is always hard to make up. Hope Javier gives mummy more restful nights. Totally agree that we need to live and eat well. I’m thinking when was the last I visited the manicurist? Looking forward to it Summer! A great list! Eatingealthily is definitely important in dealing with stress. Sleep does wonders too! My favourites would be no. 3 and 4! And no. 5 is an important reminder for me too. Thanks for this.